Trimble’s Bullet™ GG Antenna provides a perfect solution for manufacturers who need a fixed-sight, rooftop GNSS antenna. It is housed in leak tested packaging designed to withstand continuous exposure to shock, excessive vibration, extreme temperatures, water and sunlight. For added reliability, the antenna cable can be threaded through a pole mount to keep it safe from environmental damage. The Bullet GG Antenna includes advanced filtering technology for reliable performance in hostile RF jamming environments. 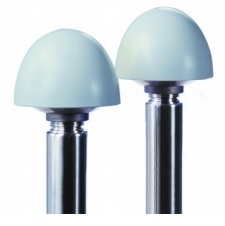 This antenna is also a high-quality solution for adding GNSS data to marine navigation systems.